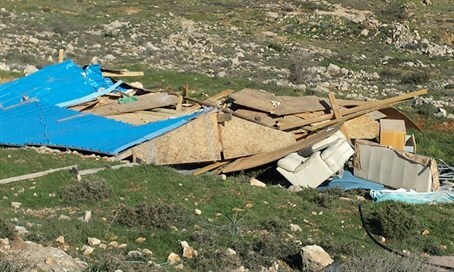 Security forces and civil administration arrived Thursday morning to the “Shchunat Gal” outpost near Hevron and demolished a fence, foundations for a barn and a building that served as a synagogue. As a result, clashes broke out between the demolition team and locals. Two minors were details but released shortly thereafter. The Civil Administration said in response to the destruction, that "demolition was enforced because a fence, shed and illegal structure that were built on private land without permit by the competent authorities."